4hr43min, 7min less than last year. I enjoyed the race even though did not make it in 4hr40min. I think I was more geared up mentally on how “long” the race was and did quite well on the first half, 21K at 2hr12min. Obviously, the mileage I have been putting in my training still has not prepared a strong physique for the latter half. 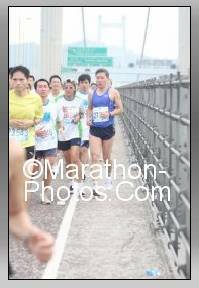 Though I am more prepared as I have always remembered that the Cheung Sha Wan part was an obstacle point for me in the past, the 24 to 30k (after Cheung Tsing Tunnel to Tai Kok Tsui) still proved to be the hardest stretch where I had to focus on not letting my pace to drop too slow. were people stretching by the roadside. People walked at times and using the ointment handled out by the AMS eniroute. At times, my feet were burning-hot. The lighter race shoes were light but I could fell the rough road underneath, as it did not have enough cushions. 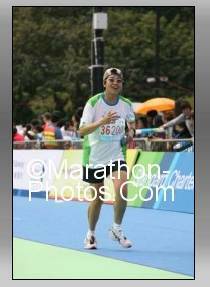 Whenever there was water stop, I walked and took water, finish half a banana before picking up my pace again. One nice thing about this year is was that there were reseal-able isotonic drinks package from water stop. I managed to have one with me all along and took sips along the route. Good physiological boost, I suppose. I took a longer “walk-break” just before the Western Tunnel. May be it was why that once I was through the Western Tunnel going back from Kowloon to HK with about 7K left, I felt energized and motivated enough even by the ups and down on the road. (Thanks for the hiking training!!!) I loved passing the people going down-slope and tried not to loose my ground when climbing up again. There was a sign of “last 2k” near to the Queensway CITIC Tower, would you believe that it was only 2K to Victoria Park from there? The last 2K would be so long if not for the spectators (would have been best if you were there of course). The Lockhart Road part was fun (still no you!). I knew I would not make the 4hr40min marks but would still want to finish before 4hr45min. I even raced with some guy who was neck-to-neck with me at the entrance to the final path leading up to the finish line (he won!). I finished, not feeling like a world champion as how I felt on the very first time I finished a Marathon but happy that it was over.